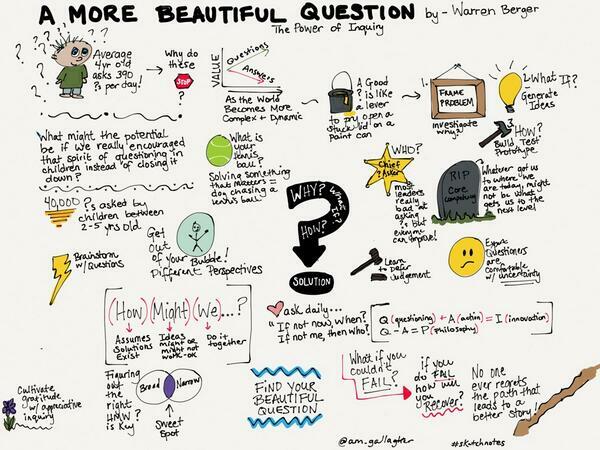 Warren Berger presents in his book A More Beautiful Question a simple but effective thinking instruction to get better questions. He also argues that posing better questions become even more relevant as search engines gives a answers and at the same time offer us preset questions before we have even entered the question in full. The WHY? question enables you to question the situation in depth but you can also get a broad perspective. I can alternate between broad “open” questions and narrow “closed”questions. Step back, and notice what is missed for others and yourself – Challenge assumptions. Look for relations and patterns. Immerse into the situation, and don’t forget “to question the questions”. Take then ownership of one question, and repeat the WHY? process 7 times. The WHAT IF? 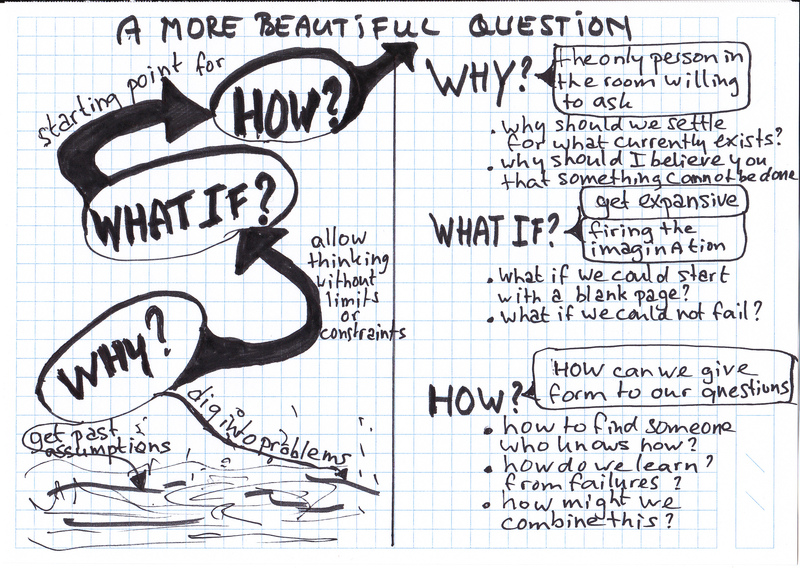 question allows us to think without limits or constraints beforehand (untested). Make associations that pop-up in your head, preferable as remotely related as possible. Think wrongly! The aim is to get feedback as a starting point for the HOW? question. The HOW? question is about how we give form to our questions. Use the WHAT IF? questions as starting points. Love dissonance and critic because that indicates that you might get to a breakthrough idea. Have you seen this writing on “The Art of Powerful Questions”? it’s from the dialogue field, where the resources of large groups are brought forward.